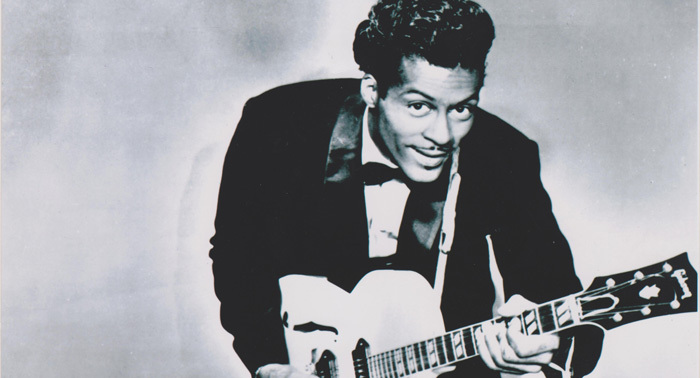 American singer-songwriter and musician Chuck Berry was one of the inventors and pioneers of rock ‘n’ roll music. Quite possibly the most influential guitarist in history, he took rhythm-and-blues and created a heavier sound by recombining it with a raw, aggressive guitar style, unexpected lyrics, and a sharp, lilting voice. His virtuosic guitar solos and showmanship had an immense impact on subsequent rock music. Born “Charles Edward Anderson Berry” in October 1926 in San Jose California, his father was a contractor and deacon of a local church. Berry led a wild adolescence. He was arrested and convicted of armed robbery and car theft while still in high school. After getting a parole approved in 1947, Berry worked on a General Motors assembly line. Chuck Berry formed a singing quartet after graduation and, by the early 1950s; he worked in a number of local bands in the nightclubs of St. Louis as an extra source of income. Berry got his first break when he sent a demo recording of his song “Maybelline” to New York disc jockey Alan Freed. Freed agreed to give the song radio time if he was given a cowriter’s credit on the song. “Maybelline” became Berry’s first top 10 hit. Berry released a string of hit singles from 1957 to 1959, including “School Days,” “Rock and Roll Music,” “Sweet Little Sixteen,” and “Johnny B. Goode”. He became a high-profile established star and an extremely popular performer on the rock music concert tours by the end of the 1950s. His “duckwalk” on stage while playing the guitar became his signature move. Berry’s career halted in December 1959 when he violated the Mann Act by having an intimate relationship with a 14-year-old Apache waitress Janice Escalante and offering her a job at his St. Louis club. He spent two years in a federal prison. Berry was released on parole in 1964. His career never fully recovered, as The Beatles and the Rolling Stones had taken over the rock-and-roll world by then. Berry nonetheless remained very much in demand on the concert tour. He had another number one hit, “My Ding-a-Ling”, in 1972. Berry currently resides in Ladue, Missouri and usually performs one Wednesday each month at Blueberry Hill, a renowned restaurant and music club located in the Delmar Loop neighborhood. Chuck Berry earned numerous awards and accolades in his career. He received the Grammy Lifetime Achievement Award in 1984, and the Kennedy Center Honors in 2000. Berry was made a laureate of the Polar Music Prize in 2004. Long known for a turbulent, troubled personal life, Chuck Berry has struggled with drug and child abuse related charges for years. He has been married to Themetta Suggs since 1948. They have four children.